Henna is done for a variety of occasions. It is an all natural temporary body art that lasts about 2 weeks then gradually fades away. Henna is a brilliant decoration for your wedding and the entire bridal party; for birthingways, blessingways, baby showers, baby-bump henna for your prenatal photo shoot; at festivals and fairs; full moon and solstice gatherings; birthday parties and sweet sixteens, at mitzvas and cupleaños, or just because! Its fun! And temporary! All of the henna that Joy uses is natural and organic, made from 100% plant derived materials. Her henna contains pure essential oils & citrus. It is safe for all ages with a very rare exception for those with a G6PD allergy or for those allergic to citrus. Natural henna is never black! *Black henna is not safe* The brown to red stain of traditional, natural henna will gradually fade in about a 7-10 days (time-frame depends on variables, such as: your body/skin chemistry, how often you wash the area, how well you care for the paste as its staining, how soft or tough the area is where you are getting henna - tough, calloused skin stains darker & longer! Torso and softer skin doesn't stain dark and won't last as long). Your henna paste is a means to an end: the purpose of the mud/paste application is to get a good stain. The stain is the part that lasts a couple of weeks. The better care you take of the paste application, the better (darker and longer) your stain will be. The paste will dry up and fall off, leaving you with the desired stain. Your henna stain will start out lighter (more of an orange tone) and then as it oxidizes, it will darken into a deep chocolate brown. 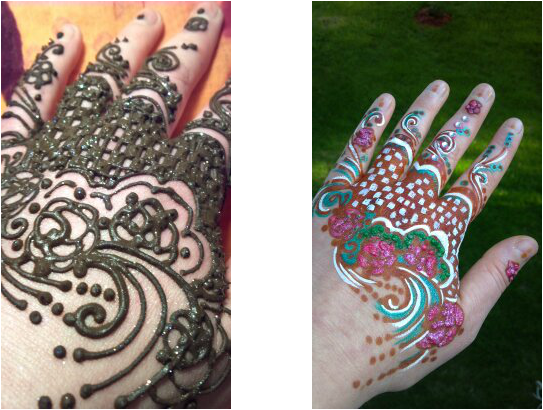 Your henna will be at its peak color approximately 2 days after the design is applied. Clients often return on the second day for more ornamentation including body paint, glitter, gilding and 'bling' to decorate the stain for a big day. Body paint and glitter colors can coordinate with your clothes to accessorize the look. 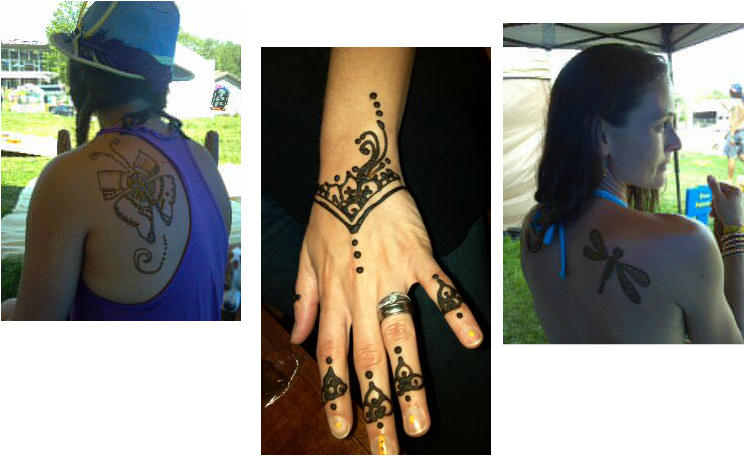 For example, if your wedding is on Saturday, we would meet to do your henna Wednesday or Thursday. Then on Friday night or Saturday morning we add crystals, bling and glitter accents. Prior to any henna treatment, make sure your skin is freshly washed, clean of lotion, sun block or self-tanner, make up and perfumes. Good "henna to skin contact" is a priority for a good stain. After your henna treatment, you must allow the mud-paste to dry without smudging. The paste must stay on for a minimum of 2 hours, but ideally longer (overnight if possible). 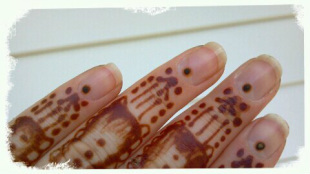 For a better stain, do your best to avoid water contact with the fresh henna for approximately 24-48 hours. Moisturize only with an all natural product such as olive oil, coco-butter or shea (avoid perfumed, synthetic, mineral-oil & petroleum-based lotions). Once your design has dried completely on your skin, and the paste begins to crumble, just let it fall off naturally (do not pick at the paste). If you need the dry henna paste off quickly but you wish to avoid water contact as suggested, you can use olive oil on a cotton ball to wipe away the dried henna paste. Natural oils will compliment the stain , whereas water will make your stain fade faster (especially if the stain is exposed to water within the first 48 hours, or during the oxidization process). Thank you for your interest! And remember to stay away from black henna containing PPD! Contact Joy for availability and pricing. View our Service Agreement for booking details.